If you read my post the other day (What Rising Interest Rates Mean for Vancouver Real Estate) then you were fully prepared for today’s interest rate hikes. To little surprise, the Bank of Canada Governor Stephen Poloz hiked interest rates 25 basis points. Yep, the first rate hike in 7 years. 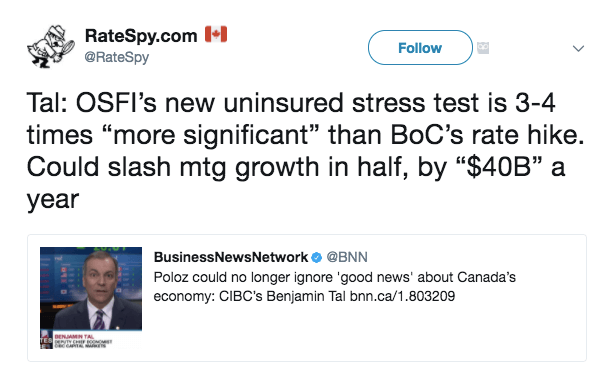 A tweet storm erupted as a hawkish Poloz hinted at another potential rate hike coming in October. Here’s a roundup of commentary from the smartest minds in the biz. Mohamed A. El-Erian, New York Times best selling author and chief economic adviser at Allianz believes the move was aimed to tame Canadian real estate prices. Meanwhile, Jared Dillan, Strategist at Mauldin Economics and author of The Daily Dirtnap believes the move was targeted at investors who have been shorting the Canadian dollar. Of course the Canadian dollar surged after the rate hike to it’s highest levels since August, 2016. Benjamin Tal, the Deputy Chief Economist of CIBC downplayed the Bank of Canada’s rate hike and instead believes the latest stress testing which I discussed last week will have a more significant impact on the Canadian real estate market moving forward. To little surprise all 5 Canadian Banks also raised their variable mortgage rates by 25 basis points following the announcement. Here’s my two cents on the big news and what it means for Vancouver real estate. Next articleIs Toronto Real Estate Following In Same Footsteps as Vancouver?